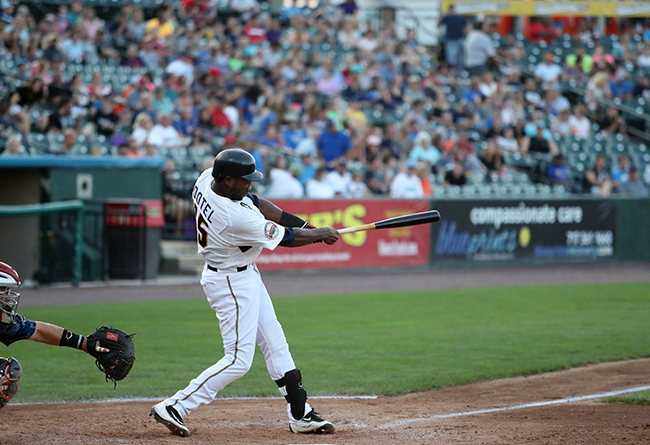 (York, Pa., March 6, 2019) - The York Revolution has made three more additions to the 2019 preseason roster, bringing back outfielder Welington Dotel and pitcher Jonathan de Marte while acquiring infielder Nate Coronado via trade. The moves were announced by manager Mark Mason during Tuesday evening’s airing of “Revs Hot Stove Weekly presented by Shipley Energy” live on SportsRadio 1350 WOYK. Dotel returns for his second season in York. The right-handed hitting outfielder batted .317 with seven home runs, 23 doubles, six triples, 60 RBI, and 19 steals in 107 games with the Revs last season, earning a selection to the Atlantic League All-Star Game in the process. The 2019 season will be Dotel’s fifth in the Atlantic League, where he is a career .321 hitter. The Dominican Republic native was named Atlantic League Player of the Year in 2015 after batting .340 (tied for first in league) with eight home runs, 31 doubles (tied for third), and league-highs in hits (180), triples (13), and steals (45) as a member of the Bridgeport Bluefish. Dotel followed that performance by batting .335 (second in league) in 95 games for the Bluefish in 2016. He spent most of 2017 in the Mexican League, batting .333 for Laguna before finishing the campaign in Bridgeport. The 33-year-old found a home in York after initially beginning the 2018 season with Sugar Land and was originally a Seattle Mariners prospect, spending the first five seasons of his pro career in their farm system. He enters his 13th pro season in 2019 as a career .316 hitter. Coronado’s rights were acquired from the Somerset Patriots in exchange for the rights to right-handed pitcher James Pugliese earlier this off-season. He combined to bat .281 with 10 home runs in 77 games between Somerset and the Lancaster Barnstormers last season after opening the season in the New York Yankees organization at High-A Tampa. The 26-year-old also stood out for Lancaster in 2017, batting .333 with six homers, 16 steals, and 38 RBI in just 60 games after also playing in the Colorado Rockies farm system that season. He has seen time at every infield position during his pro career and is a .293 lifetime hitter. De Marte appeared in five games out of the Revs bullpen late last season, allowing just two runs on four hits in five innings of work while striking out five batters, as four of his five outings were scoreless. He was acquired in September after impressing in the Frontier League with Normal, where he owned a 2.87 ERA and seven saves in 42 outings during just his second pro season. With Normal, he allowed just 42 hits and struck out 58 compared to 18 walks in 53.1 innings. The University of Richmond product made his pro debut with Normal in 2017 and is 5-5 with a 3.77 ERA in his pro career, having allowed just 69 hits in 86.0 innings while striking out 99 batters. De Marte is a native of Yorktown Heights, NY, and was twice named the Gatorade Player of the Year in New York State while also earning a Louisville Slugger All-America selection during his prep days. The 25-year-old enters his third pro season in 2019. The Revs now have 15 players under contract for the 2019 season and will continue to unveil player signings live on “Revs Hot Stove Weekly” presented by Shipley Energy each week on SportsRadio 1350 WOYK, woyk1350.com, and The New WOYK app. The next episode is set to air Tuesday, March 12, at 6:30 p.m., immediately following “The Baltimore Baseball Show” with Dan Connolly of The Athletic Baltimore.